Take a break from Perth with a short trip to Fremantle Prison in Fremantle, about 32 minutes away. 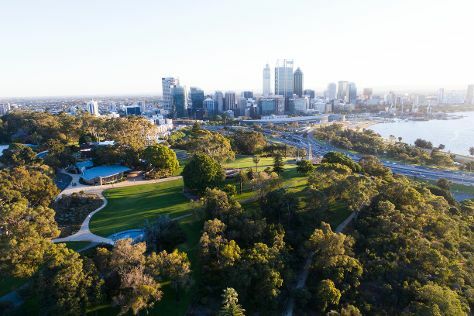 There's lots more to do: take in nature's colorful creations at Kings Park & Botanic Garden, enjoy the sand and surf at Cottesloe Beach, get your game on at Elizabeth Quay Carousel, and explore the activities along Swan River. For photos, more things to do, maps, and tourist information, use the Perth road trip site . Kuala Lumpur, Malaysia to Perth is an approximately 9-hour flight. You can also do a combination of train and flight. Expect little chillier evenings in Perth when traveling from Kuala Lumpur in February, with lows around 20°C. Cap off your sightseeing on the 5th (Tue) early enough to travel to Perth (Tasmania). Perth is a town in northern Tasmania, Australia. Start off your visit on the 6th (Wed): meet the residents at Seahorse World and then admire the sheer force of Halls Falls. Get ready for a full day of sightseeing on the next day: stop by Brush Rabbit, then identify plant and animal life at Trowunna Wildlife Sanctuary, and then admire the sheer force of Liffey Falls. To see ratings, traveler tips, where to stay, and more tourist information, read Perth (Tasmania) trip planning site . Use the Route module to find suitable travel options from Perth to Perth (Tasmania). Due to the time zone difference, you'll lose 2 hours traveling from Perth to Perth (Tasmania). Traveling from Perth in February, things will get a bit cooler in Perth (Tasmania): highs are around 28°C and lows about 13°C. Wrap up your sightseeing by early afternoon on the 8th (Fri) to allow enough time to travel back home.